The automotive solenoid valve Market is estimated to surpass $42.28 billion mark by 2023 growing at an estimated CAGR of more than 15% during 2018 to 2023. The shipment of automated solenoid valves is estimated to surpass $466.5m units growing at A CAGR of 4.13%. Asia-Pacific holds the highest market share of 54% due to sheer demographic size and automobiles becoming a commodity in this region supported by advancements in standard of living. What is automotive solenoid valve? Automotive solenoid valves are electromechanically controlled valves. These valves control the rate of flow of air or fluid in systems and motors in automobiles. Solenoids are devices that convert electrical energy into mechanical energy, creating a magnetic reaction, this occurs when electric current makes its way through the wire in the solenoid. These are usually used to hydraulic systems and power fluid. Different types of solenoid valves include direct-acting valves which is utilized to prevent the development of too much pressure in a device, pilot-operated valves also called as indirect valves or servo operated used for one flow direction, two-way valves which have one inlet and one outlet used to permit and stop the fluid flow. 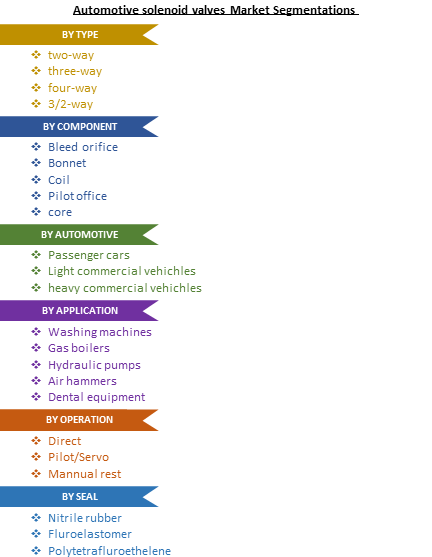 What are the major applications for automotive solenoid valve? Solenoids have different functionalities such as it can be used to start the car or active the sprinkler system. It mainly controls the flow in fluid, motors and air powered systems. Solenoids are the most used components in liquid and gas circuits. Some of the applications of solenoid valves include industrial automation, air hammers, washing machine, gas boilers, hydraulic pumps, compressed air technology, car wash systems, heating systems, irrigation systems, dental equipment, sprinkler systems and others. Pursuing more energy-efficient, convenient, and high-tech products with user-friendly design has always been the general direction of valve development. On the basis of minimizing the energy consumption, reducing the fluid flow resistance and decreasing the consumption during the using process have always added value. In the energy-saving, the focus is the electric device. By selecting low-power and low-noise motor and improving its structure, you can control the energy consumption of electric device which will lead to the development of the valve industry. One of the prominent trends that the market is witnessing are development of Hybrid electric vehicle (HEV) and electric vehicle (EV) are increasing, development of new solenoid valves such as micro-miniature valves customized valves and pinch valves are gaining prominence. BorgWarner received Automotive News PACE Innovation Partnership Award for its collaboration with General Motors (GM) on the Eco-Launch solenoid valve. The innovative technology helps deliver improved fuel economy and performance at significantly lower cost than alternative systems. Rotex Company showcased its range of Hydrocarbon Dosing Solenoid Valve/Modules for DPF regeneration system and AMT Control Solenoid Valve Modules for the commercial vehicle segment. Also on display were several new Solenoid Valves for application like Advanced Fuel injection/metering system, Power Take-off systems, coolant and air delivery management and innovative control valves for comfort seating systems. Who are the Major Players in automotive solenoid valve market? Danfoss A/s, Curtiss-right corporation, Burkert fluid control systems, Kingston Valves, SMC corporation, ODE solenoid valves, magnet scultz.